Last night’s last meal in Berlin: Leberkäs, what else? — at Berlin Friedrichstraße station. … The joke is that it is neither liver nor cheese and definitely not Berlin-ish. 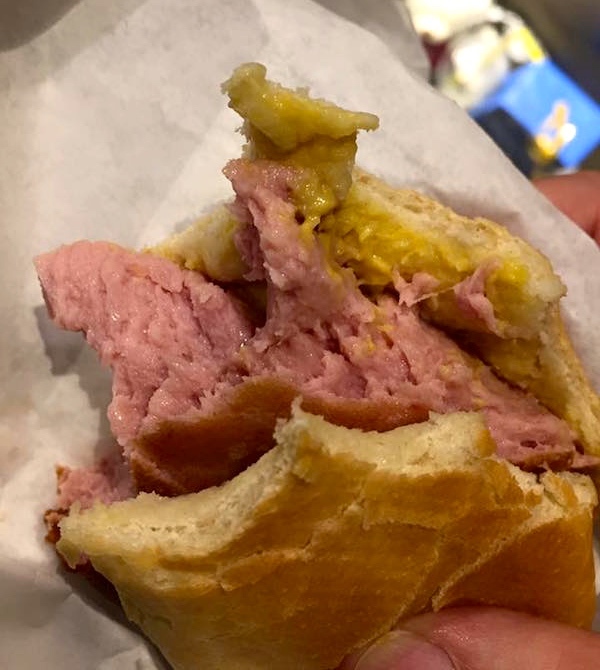 Leberkäse (German, literally means ‘liver cheese’; sometimes spelled Leberkäs or Leberka(a)s in Austria and the Swabian, Bavarian and Franconian parts of Germany and Fleischkäse in Saarland, Baden, Switzerland and Tyrol) is a specialty food found in the south of Germany, in Austria and parts of Switzerland, similar to bologna sausage. It consists of corned beef, pork, bacon and onions and is made by grinding the ingredients very finely and then baking it as a loaf in a bread pan until it has a crunchy brown crust. Leberkäse is said to have been invented in 1776 by the cook of Charles Theodore, Elector of Bavaria, although this story has been heavily contested. 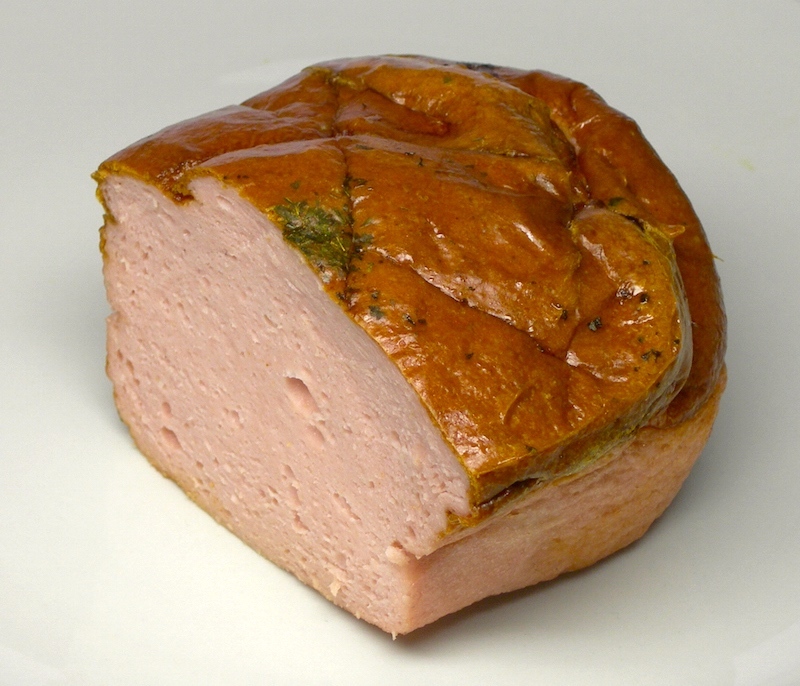 The name “Leberkäse” literally translates to “liver-cheese” due to the fact that the older recipe included liver and because of the cheese-like texture of the dish. Since the modern version typically includes no liver, the term “Fleischkäse” (literally ‘meat-cheese’) became widespread in German. Most of the time it is served on a semmel (bread roll) while still hot and traditionally seasoned with mustard or pickles. 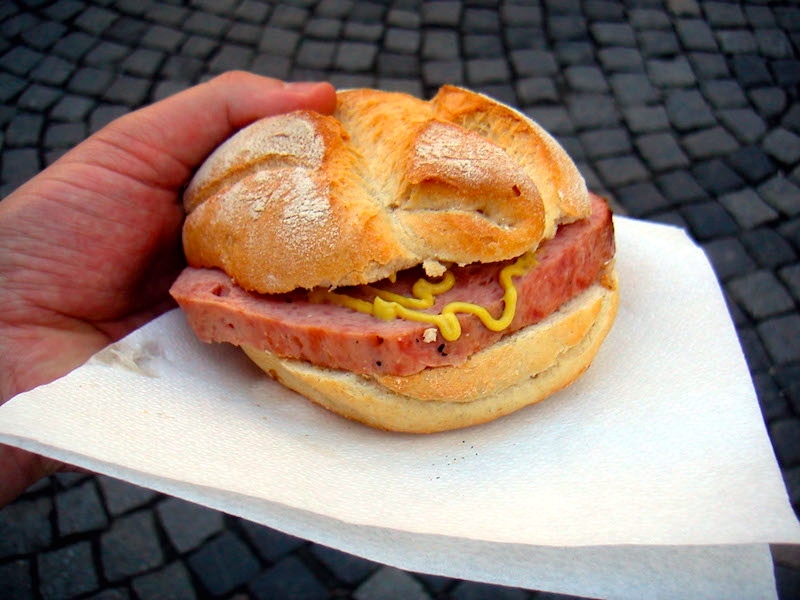 The result, generally called Leberkäsesemmel (in Swabia and the Franconian parts of Bavaria, Leberkäsweckle, Leberkäsweggla or LKW in short), is a staple of South-German and Austrian fast food stalls, butcher shops and supermarkets. … Cut into approximately finger-thick slices, usually served with süßer Senf (Bavarian sweet mustard) and soft pretzels, Sauerkraut or Kartoffelsalat (potato salad). As a compound, liver cheese would be resembloid rather than subsective — liver cheese is not cheese, but resembles cheese in some way — and is connected to liver mostly only through its history, so the semantic relationship between its parts is opaque. The stuff is a close cousin of sausage — made from ground meats of several kinds, sometimes including organ meats, then cooked — but formed into a loaf rather than encased in a skin. 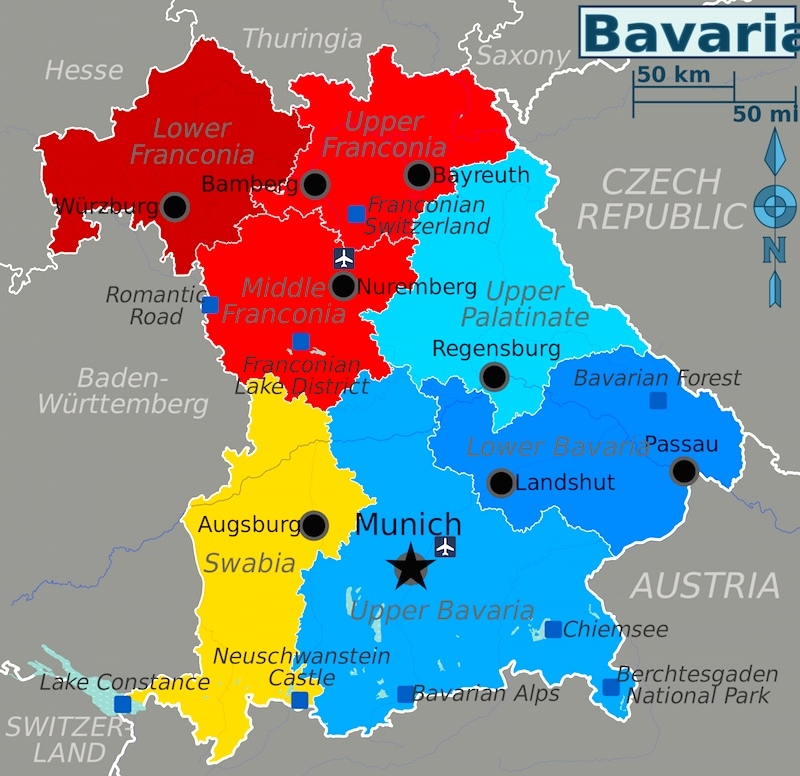 The Free State of Bavaria … is a federal state of Germany. In the southeast of the country with an area of 70,548 square kilometres (27,200 sq mi), it is the largest state, making up almost a fifth of the total land area of Germany, and with 12.5 million inhabitants is Germany’s second most populous state. Munich, Bavaria’s capital and largest city, is the third largest city in Germany. An especially nice map, showing the areas of Bavaria and also the surrounding political entities, in Germany and outside it. 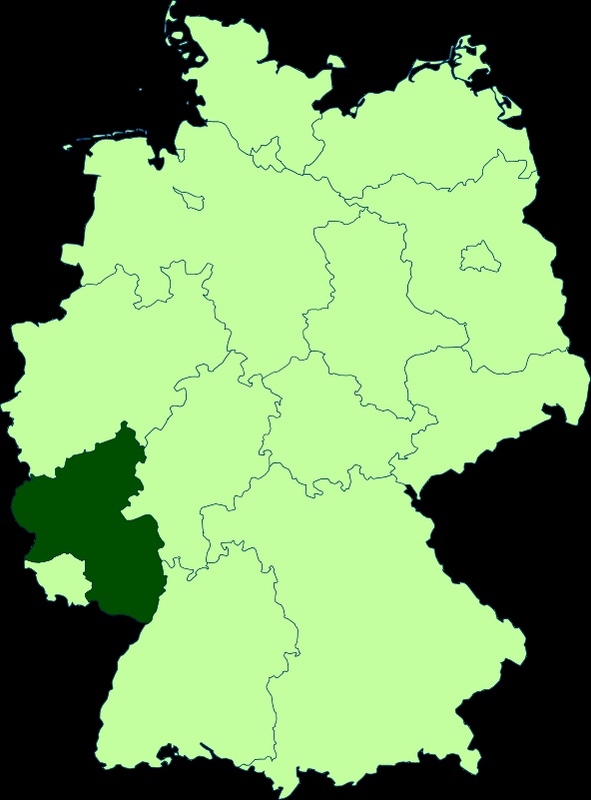 … Located in western Germany, the Rhineland-Palatinate borders (from the north and clockwise) the German Bundesländer North Rhine-Westphalia, Hesse, and Baden-Württemberg. It shares an international border with France, followed by another Bundesland, Saarland, and international borders with Luxembourg and Belgium. … The Pennsylvania Dutch spoken by the Amish in the United States is (among other dialects) derived from the German dialect spoken in the Rhineland-Palatinate, which many Palatine refugees brought to the colony in the early decades of the 18th century. Mass emigration of Palatines [as religious refugees, Protestants in a significantly Catholic land, and also as political refugees, fleeing invasions by the French] began out of Germany in the early 18th century from areas along the Rhine River. The Pennsylvania Dutch maintained numerous religious affiliations, with the greatest number being Lutheran or Reformed, but many Anabaptists as well. The Anabaptist religions promoted a simple lifestyle and their adherents were known as Plain people or Plain Dutch [among them, the Mennonites and the Amish]. This was in contrast to the Fancy Dutch, who tended to assimilate more easily into the American mainstream. Lebanon bologna is a type of cured, smoked, and fermented semi-dry sausage. 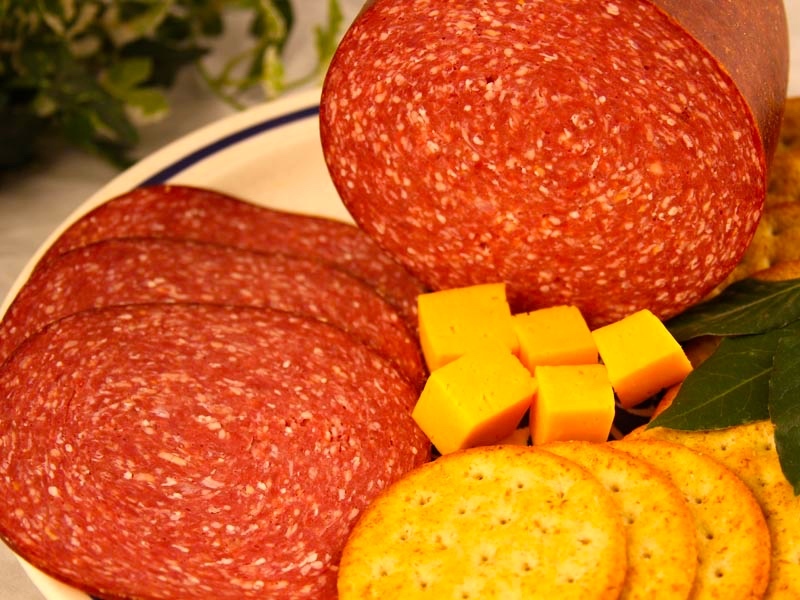 Made of beef, it is similar in appearance and texture to salami, though somewhat darker in color. Lebanon bologna has a distinct tangy flavor, more so than other fermented meat products such as summer sausage. Hardwood smoking imparts a strong smoky flavor to the traditionally prepared versions of the product. Lebanon bologna was developed in the 19th century by the Pennsylvania Dutch of Lebanon County, Pennsylvania, reflecting the slow-cured and smoked sausage traditions of northern Europe. Still produced primarily in that area, it is nowadays available in markets throughout the United States and typically served as a cold cut as well as an appetizer. The Pennsylvania Dutch live primarily in Southeastern and South Central Pennsylvania in the area stretching in an arc from Bethlehem and Allentown through Reading, Lebanon, and Lancaster to York and Chambersburg. They can also be found down throughout the Shenandoah Valley (the modern Interstate 81 corridor) in the adjacent states of Maryland, Virginia, West Virginia and North Carolina, and in the large Amish and Mennonite communities in Mifflin County, Pennsylvania, in Ohio north and south of Youngstown and in Indiana around Elkhart. After the American Revolution, John Graves Simcoe, Lieutenant Governor of Upper Canada, invited pacifists from the former American Colonies, including Mennonites and German Baptist Brethren, to settle in British North American territory on the promise of exemption from military service and the swearing of judicial oaths. This has resulted in small communities of Pennsylvania Dutch speakers emigrating to Canada. Today, the language is mostly spoken in the Waterloo Region. My Pa. Dutch grandmother grew up in Lancaster County. I was born in Allentown, the county seat of Lehigh County, but mostly grew up outside of Reading, the county seat of Berks County. Ned grew up in Bethlehem, which is partly in Lehigh, partly in Northampton County (which has Easton as its county seat). My Pa. Dutch grandmother’s famiiy connections were widely distributed throughout Lancaster, Lebanon, Berks, Lehigh, and Northampton Counties and on throughout the Pa. Dutch arc. This entry was posted on September 28, 2015 at 8:34 am and is filed under Compounds, Language and food, My life. You can follow any responses to this entry through the RSS 2.0 feed. You can leave a response, or trackback from your own site. cf. “head cheese,” i.e. Kopfkäse, which likewise is not cheese. As for “name has nothing to do with actual ingredients,” there is the well-known example of egg creams.